Glögg is a traditional Christmas punch in Scandinavian countries. 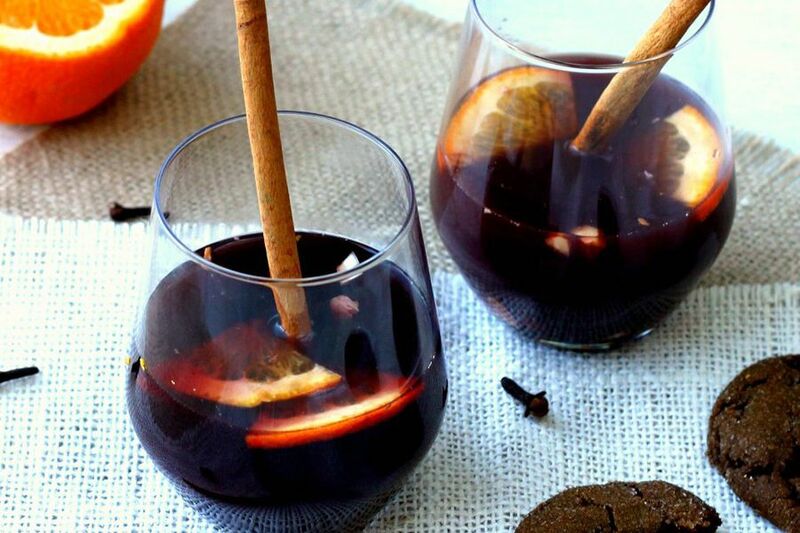 It's a lot like mulled wine, but it packs on the flavor and uses more alcohol than normal. This recipe by Morten Sohlberg from New York City's Smörgas Chef is a slight adaptation on tradition and is the perfect warm punch to serve at any holiday party. There are just a few additions in this recipe from an easier glögg recipe, but they really do not create much more work. The ginger, vanilla, nutmeg, and brown sugar give the warm drink a spectacular touch of spice. Also, Sohlberg uses both vodka and either brandy or spiced rum to accent the red wine base, so it has a little more of a punch. The spiced rum is an excellent suggestion because it works nicely against the other spices. The recipe makes about 10 8-ounce servings, making it perfect for an intimate gathering. In a large pot, heat the water, brandy, and spices, bringing the mixture to a boil. Reduce the heat and simmer for 10 minutes. Stir in the wine, vodka, and sugar, and simmer for 1 minute. Strain out the cloves and orange peel and decant the glögg, leaving the other spices behind. Add raisins and almonds to each glass upon serving. Decanting means to pour wine into a decanter, a long-necked glass vessel with a wide base that looks a lot like a fancy flower vase. The movement helps the wine "breathe" and it's often used for red wines. You do not need a special decanter to enjoy this glögg. Simply pour the beverage into any serving pitcher that can handle a little heat. If you're afraid of the glass (or your serving glasses) breaking, allow your glögg to cool slightly before pouring it. There are many great dry red wines to choose from. In general, Bordeaux, Cabernet Sauvignon, Malbec, Pinot Noir, Syrah, and Zinfandel are among the driest styles, though you will find some slightly sweeter wines within those. Don't worry too much about finding the "perfect" dry red, though! There's so much going on in this punch that you will barely be able to tell the difference. How Strong Is Smorgas Chef's Glögg? It's very interesting to do the math on this recipe because the glögg's alcohol content is the same as the wine that goes into it. That's because the water offsets the potency of the liquors. For example, if you pour a 12 percent ABV wine, you can expect the punch to be similar in strength.